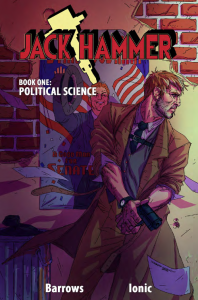 Jack Hammer: Political Science is an independent comic series from the creative team of Brandon Barrows and Ionic that is receiving its first completed collected edition via Action Lab Entertainment. The story revolves around ultra persistent and tough as they come private detective Jack McGriskin. After discovering, the person he had been hired to find is dead, Detective McGriskin stumbles upon a network of corruption that stretches from the streets of Boston, all the way to the halls of Congress. 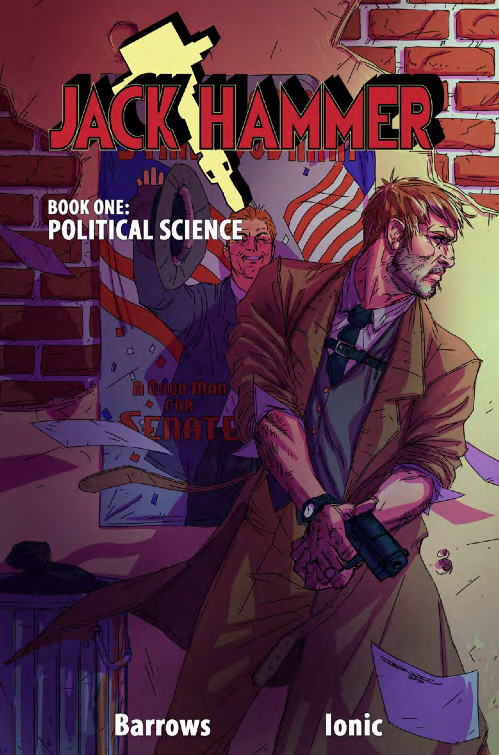 Jack Hammer: Political Science is a picture perfect example of high quality gritty noir storytelling. The addition of superpowers further increases the depth of the world creating a very intriguing reading experience. The heavy dialog storytelling approach sets a flawless pace, each step of the investigation is given its time to shine, and this ensures readers become completely enthralled in the case as it unfolds. Imagine Kolchak meets Law & Order with just a dash of Heroes, a finely fashioned blend of new school meets old school. Ionic’s artwork is breathtakingly beautiful, vivid colors set it apart from other noir series’ that tend to stick to more bleak and dreary color palettes. The insanely high level of quality of the books over all visual presentation takes it to that next level needed to create a total package experience. Jack Hammer: Political Science is sure to captivate readers both mentally and visually, a feat many similarly styled books fall short of. By paying close attention to crafting both a unique story twist and art style the book really stands out from other genre books. Fans of hard broiled crime dramas looking for something that strays just far enough from the age-old genre formula to be fresh and interesting, yet still familiar need look no further, this is the book you have been searching for. At this point, it is safe to say that if you spot the Action Lab Entertainment seal on a book that is worth your time and hard earned dollars. With a never-ending onslaught of memorable releases if you have not done so already, you really need to add them onto your lists of publishers to follow. Set to release in June 2012 both digitally and in psychical format, Jack Hammer: Political Science is one to look out for. Readers who would like to pre-order their copy to ensure they do not miss out can do so by following one of the two links below. For more information on other Action Lab Entertainment releases, past, present, and future be sure to visit their official website [link].